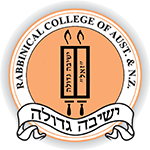 Reb Zalman and Yeshivah Gedolah - Rabbinical College of Australia and N.Z. The history of Reb Zalman’s contribution to Yeshivah Gedolah really begins some twenty years prior to its establishment, shortly after his arrival in Australia in 1949. In November of that year, Reb Zalman oversaw the founding of a fledgling Yeshivah in Shepparton, with three students. As in any European Yeshivah, the students learned in Yiddish, and they lived and slept on the Shepparton premises, and subsequently, at Burwood. In the ensuing five years, it became clear that most parents were not prepared to send their children to an old-style Yeshivah. Thus, the focus evolved into creating successful primary and high schools (Yeshivah College and Beth Rivkah), integrating both Jewish and secular studies, in order to create a climate ripe for higher Jewish education. After the committee approved Reb Zalman's project, he thereupon wrote to the Lubavitcher Rebbe, Rabbi Menachem Mendel Schneerson, asking for his approval and blessing. While waiting for a response, Reb Zalman wasted no time; he threw himself into the formidable task of founding a full-time and viable Yeshivah Gedolah. Reb Zalman reached out to the parents of many prospective students, asking them to defer university education for at least one year, in order that their children have the opportunity to learn Torah on a tertiary level, whilst immersed in a total Torah environment. Similarly, he contacted those parents who were intending to send their sons overseas to persuade them to bolster the establishment of a local Yeshivah Gedolah. After much toil, six boys were tentatively enrolled for the first semester, scheduled to begin right after the summer holidays. However, the summer neared its end, and still no reply had been received from the Rebbe. Although Reb Zalman was convinced that the founding of Yeshivah Gedolah was consistent with the Rebbe’s wishes, he nevertheless sought clear confirmation. “In answer to their letter, concerning the opening of a class for a Yeshivah Gedolah, it is very appropriate and very important. The dean for the Gemorah and Chassidus should be someone … for a variety of reasons. For the benefit of the supervision and development of the institution, it should be in the near vicinity of the existing institutions, at least for the first years. After receipt of this telegram, everything else began to fall into place. Mr Mendel New loaned his new property on Goathlands Street to Yeshivah Gedolah for a period of two months. The Yeshivah opened with six students; Rabbi Lazer Herzog was appointed Rosh Yeshivah, and Reb Zalman Serebryanski took up the position of Mashpia. Later, at its modest premises in Meadow Street, Reb Zalman's son Chaim shouldered a great share of the burden, entirely in a voluntary capacity. Since Yeshivah College wasn't able to finance the new institution, Yeshivah Gedolah commenced as an independent entity. Together with Rabbi Shalom Gutnick, Reb Zalman went out into the community to raise funds. A very warm and positive response was received by the general community. Reb Zalman sought out and ensured the viability of Yeshivah Gedolah, not only in the spiritual sense, but also in the material sense. Above all, Reb Zalman was renowned for total devotion to the pupils under his tutelage. He lived by the Baal Shem Tov’s adage that “another Jew’s physical needs is your spiritual duty”. Reb Zalman loved and cared for each one of us. When I was in the Yeshivah, he would often interrupt my studies simply to ask whether I had slept well or whether I had eaten enough. Three years ago, I met Reb Zalman after an absence of twenty years. Upon seeing me, Reb Zalman spontaneously exclaimed “Ichel!” When I asked how he could have possibly remembered my name after so many years, he said simply, “from your eyes”. Reb Zalman must have taught many hundreds of students since my time. Yet I am sure that he remembered each one of them, too, by their eyes. You see, the eyes are a reflection of the soul, and Reb Zalman could penetrate to the very soul.